Each year, the medical students of the Perelman School of Medicine of the University of Pennsylvania recognize members of the house staff for educational excellence. 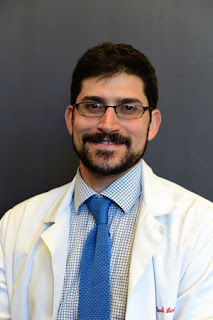 This year, class of 2018 neurology resident Noah Levinson has been chosen as a recipient of this award, the Penn Pearl. Noah will be honored at an awards ceremony on March 15th, at which he will be invited to share a 3 minute "pearl" of clinical wisdom. Noah's recognition is part of a long tradition within the Department of Neurology of focus upon our educational mission. The Neurology clinical clerkship is consistently the highest rated clerkship amongst medical students at the University of Pennsylvania. Our faculty and residents are recognized yearly for their teaching excellence. Residents can dedicate elective time to education training as part of the Medical Education Track, and attend monthly meetings of the education firm to receive further didactic training in teaching skills, and review advances and topics from the field of medical education. Congratulations to Noah for continuing a Penn tradition.